Shop Tuff's Compact Rubber Wheel Chock Pair safely secures your vehicle, trailer, and other devices from unwanted movement. This product consists of two chocks connected by a strong nylon rope. The 5 x 3 x 3 inch chock pair is the perfect size for securing your load and is compact enough to easily transport it where you need it. The anti-slip design of the chock pair ensures that this chock pair will stay securely in place. This chock pair is made of a tough, rubber material that is resistant to oil, acid, UV, and salt, making this a long-lasting Tuff product that you can count on. 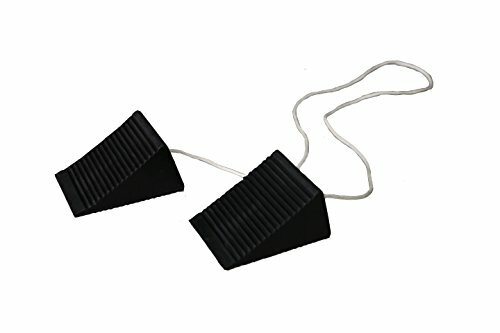 Pair of two rubber chocks connected with nylon rope, ensuring that they won't get separated! If you have any questions about this product by Shop Tuff, contact us by completing and submitting the form below. If you are looking for a specif part number, please include it with your message.